This entry recipe comes from Diana who has a lovely blog that is a wealth of information on gardening and wildlife and beautiful photos to go along with. If you haven't had the opportunity to visit, I encourage you to go check it out., she has added her links at the bottom. Here is the email she sent with her entry. 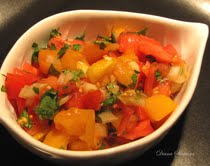 Thank you Diana for sharing this colorful and refreshing salsa! Wife of Mr. B. (perfect in all ways like all husbands in bloggerland). Lover of all textiles and manipulation of. I find joy in cooking,thrifting, gardening, chicken rearing, our 2 dogs 1 cat and my aprons. And....depend totally on The Lord to keep me in line.